It is very important to wear the correct clothing. 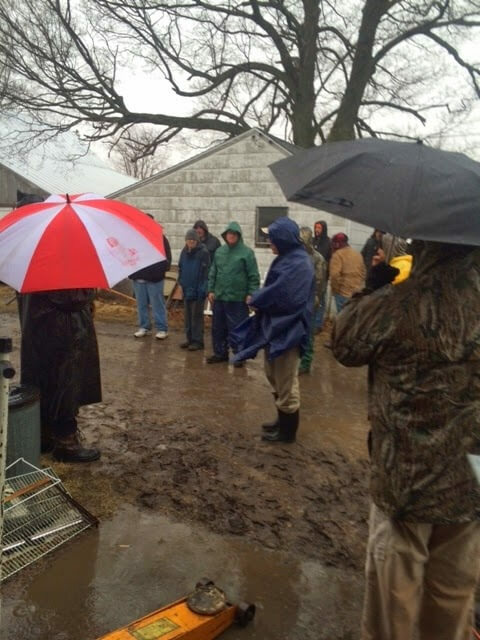 The other day we had a rainy outside auction. The temperature was 50 degrees and it rained most of the time. There were old cars, engines and miscellaneous scrap metal all over the farm. We slogged through ankle deep mud from 8:00 AM until 4:30 PM. I was so glad that I had dressed in layers with a rain poncho and rubber boots. Others were not as prepared for this weather and setting. One man lost his dress shoe when it stuck in the mire. Another fell when trying to wade through a thick spot. Numerous others ruined good tennis shoes. I was also surprised that many had not worn any kind of rain gear and were trying to cut holes in black plastic garbage bags to put on and keep somewhat dry. Yes, it is very important to have the right kind of clothes. There is a correct attire for heaven too. No one is allowed in when they are covered with the mire of this world. Everyone who enters must be wearing a white robe of righteousness. This is not a garment we can get for ourselves. We need to allow Christ to clothe us with His righteousness. When He died on the cross He shed His blood to wash the muck and mire of our sin away. By accepting His payment for our sin, we receive His righteousness making us right with God and fit for heaven. Though we continue to live in a world full of sin we are now wearing the right clothes. When God looks at us He no longer sees our sin but the pure white robe of Christ’s righteousness. When I go to an outside auction I always take the time to dress appropriately and wear the right gear. I was warm today when others were wet and cold. In like manner, I am glad that when God looks at me He sees a nice clean robe of righteousness and not my muddy rubber boots. What about you? Are you wearing the right clothes?